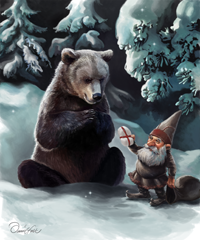 The Tomte (or Nisse in Norway or Denmark) of ancient Scandinavian folklore was a small, elusive, solitary, nocturnal creature. (Tomtar is the plural in Swedish.) The name is derived from the Swedish word “tomt”, meaning the plot comprising a homestead. This connection to the land is a central part of his psyche. Early on, Scandinavians engaged in ancestor worship. 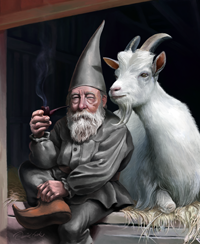 Some regarded the local tomte as the soul or spirit of the one who cleared the homestead. He was rumored to live among burial mounds. Tomtar were sometimes attributed supernatural strength, something approaching invisibility, and the ability to shape shift. They were only rarely seen, usually with just a glimpse. As you might guess, tomtar were usually found around farms. They were said to have a deep unwavering love and respect for both the land and its animals. A farmer who shared that love and respect was rewarded with fierce loyalty. 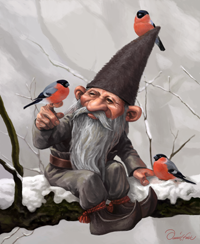 The tomte would look after the family and farm at night and would often leave small treats for the farm animals. It was customary for farmers to leave small gifts (often something to eat) in return. According to folklore, tomtar were industrious. Farmers often awoke to find that work or household chores, left unfinished, had been completed during the night. Of course, this would delight the family. It was considered lucky for a farm to have a tomte, and jealous neighbors often attributed a farm’s success to the industry of those unseen hands. However, tomtar tended to be somewhat bipolar. While fiercely loyal, they were also very short-tempered, extremely proud, easily offended, famously temperamental, and sometimes mischievous. 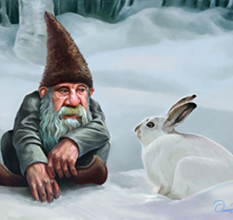 According to folklore, failure to show proper respect for the land, the animals, or for the tomte himself was sure to be met with retribution, ranging from a box on the ears to the pathological ruin of the farm. A tomte was also offended by farm workers who swore, drank alcohol, or urinated in the barn. He would not tolerate a messy barn or mistreatment of the farm animals. If a farmer’s wife spilled water, it was customary to shout a warning so that any tomte who might happen to be under the floor boards would not think the dousing was deliberate. Such a mistake was said to be catastrophic. One of the most famously temperamental episodes in folklore concerns a tomte for whom a bowl of porridge with a pat of butter was routinely left in the barn. One night he found the porridge with no butter on top and thought, “After all that I have done, they can’t even spare a pat of butter for me.” In a fit of rage, the tomte killed the farmer’s cow. After that piece of work, he was hungry and eventually ate the porridge. At the bottom of the bowl, he found the butter. Overcome with remorse, the tomte carried the dead cow to the neighbor’s farm where he exchanged it for an identical cow during the night. 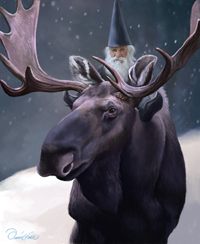 The tomte was obliged to spend much of the following spring standing in a stream at the edge of the property, in order to prevent the cow from returning to its customary pastures. As Scandinavia became Christian, tomtar were associated with its pagan past and demonized. Depictions of them from the Middle Ages are distinctly ghoulish. At this time, jealous neighbors might attribute a farm’s success to the unseen hand of Satan and his minions. It was dangerous for a farm to be too successful. Nonetheless, tomtar remained in the collective consciousness and did not pass from memory. During the Romantic Era of the middle to late nineteenth century tomtar were rehabilitated. Long associated with an exchange of gifts, it was said in Denmark after about 1840 that Christmas gifts were delivered by a tomte. In 1881, a poem by Viktor Rydberg about a tomte on Christmas Eve was published in Sweden. A few years later, the “Jultomte” (Yule Tomte) was integrated into the emerging Father Christmas story from Victorian England. His delivery service expanded to include Sweden and Norway. Tomtar were said to have dressed like the local farmers. The famous illustration by Jenny Nyström that accompanied the publication of the Rydberg poem showed a figure with a white beard and a red stocking hat. This rather Danish look is consistent with the association of the tomte with Christmas there. It shaped our original image of Santa Claus... before the Coca-Cola advertizements. 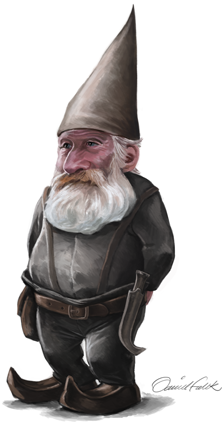 The depictions on our website and cards are based on the typical dress of Swedish farmers from this era. The look reminds one of a modern Christmas elf. 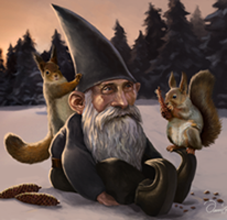 Remarkably similar legends persist across northern Europe, stretching from the Ukraine through Europe to Spain, England, and Scandinavia (e.g., Brownie, Duende, Kobold, Heinselmännchen, Tonttu, and Domovoi). both Neanderthals and humans in Asia interbred with a race of small hominids (Homo Denisova). Today genetic inheritance from Homo Denisova appears confined to Melanesia, where about 5% of the typical human genome can be attributed to Homo Denisova. Finally, there is evidence suggesting that following the end of the last ice age, about 10,000 years ago, northern Europe was repopulated by migration from Eurasia; most likely from around Ukraine. So, while it is plausible that Europeans (or their ancestors) may have once co-existed with a race of small hominids, there is not yet any direct evidence. The word “Tomte” has also been adopted into the German language. You will occasionally see the German form of the plural, “Tomten”, used in English texts. It is a long dark arctic winter night, warmed only by the glow of Northern Lights. The soft shadows lend a sense of peace to the scene. You can almost hear that special silence that follows a new snowfall. You can almost feel the wide-open space and stillness. Tomtar had deep affection for all animals and were said to be excellent riders. 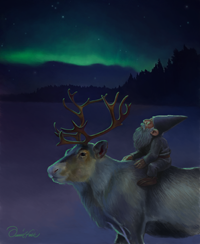 Here one pauses to view the Northern Lights with his close friend. May family be... well, family.